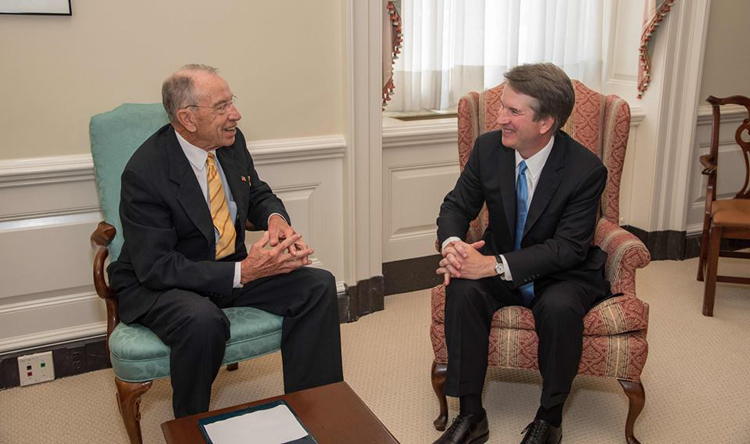 Senate Judiciary Committee Chairman Chuck Grassley meets with Supreme Court nominee Brett Kavanaugh on July 12./Office of Sen. Chuck Grassley, R-Iowa, via Wikimedia Commons. Confirmation hearings for Supreme Court nominee Brett Kavanaugh will begin on Sept. 4. Senate Judiciary Committee Chairman Charles Grassley, R-Iowa, announced the date Friday, report the Hill, the Washington Post and the Wall Street Journal. According to the Post, senators will give opening statements on the first day of the hearing. Kavanaugh will be questioned on Sept. 5. Other witnesses, including the ABA, will appear next. Republicans hope to confirm Kavanaugh before the Supreme Court term begins in October. A quick confirmation would also come in advance of the midterm elections. Republicans currently have a 51-49 Senate majority. Nan Aron, president of the Alliance for Justice, said in a statement that the hearing date “is jaw-dropping” because there won’t be enough time for the National Archives to review and release all of Kavanaugh’s records. Carrie Severino, chief counsel and policy director for the Judicial Crisis Network, countered with a statement questioning the motivation for stated concerns about unreleased documents. “Democrats have already announced that they oppose him, so this claim that they need more time or more documents is nothing more than a show, a fishing expedition designed to obstruct and create gridlock,” Severino said.